Lots to talk about. First a couple of exciting shows this weekend: Friday Night in Kingston, NY, Joey Eppard and Billy Riker will be at The Rondout Music Lounge for an intimate evening of great original music and improv. Then, Saturday Night Joey teams up with The Gartdrumm and Alana Orchid to bring their uniuqe blend of virtuosity and soul to Harmony Woodstock. Also on the horizon, “3” will be playing their annual Bearsville show in Woodstock, NY on February 2nd so make your plans now! In another bit of exciting news, 3 leadsinger, Joey Eppard’s live acoustic dvd is nearing completion. 29 Songs, nearly 2.5 hours of music shot in HD. If you pre-order now you will be sent a special link for a bonus download of the audio from set 1 (15 songs) plus 2 unreleased studio tracks from the Jersville sessions and aslo a cover I did with my wife of John Lennon’s Happy Christmas (war is over). Another noteworthy event; Joey Eppard will be singing as Jesus in Paul Green’s (School of Rock) Production of Jesus Christ Superstar on February 9th and 10th. Its an amazing cast featuring the likes of Tracy Bonham, Gene Ween, Acacia Bowman and many more! Get your tickets soon or there will be none left! Jesus Christ Superstar featuring Joey Eppard and many more! Greetings friends… Its been an amazing run of shows since we kicked things off at UPAC back in September. Thank you to all who supported us and helped make this tour possible. Thanks to our friends in Coheed and The Dear Hunter for an unforgettable tour. Now that we’re home for the holidays and plotting our next big adventure we’ve booked some special shows in our “local” area. We wish you all a wonderful solstice, happy holidays and a transformative new year that will hopefully see “3” touring in a town near you! Don’t Miss 3’s Annual Bearsville Performance this February!!!! Due to Coheed & Cambria postponing some of their tour dates, the 3 dates are postponed as well. Original tickets will be honored for the new dates below. Sorry for the inconvenience. UPDATE: Our show in Toronto has also been rescheduled to December 8th due to Hurricane Sandy. The first half of our tour with Coheed has been amazing! So many great nights, from kicking things off at UPAC in our hometown to the sold out Atlantic City show, we haven’t had this much fun on the road in years. Who knew Buffalo and Rochester could rock so hard? We will definitely be revisiting. We’d like to thank our fans for the strong showings on this tour, especially in Hartford and Worcester. We’d also like to thank our new fans! It means a lot when people who are seeing us for the first time have such incredible things to say after our performances! Now that the buzz for “3” is once again on the rise we are landing some nice East Coast headliners. For those of you who’ve seen what we can do with a 1/2 hour set, we couldn’t be more excited to show you what we can do with a full length performance! 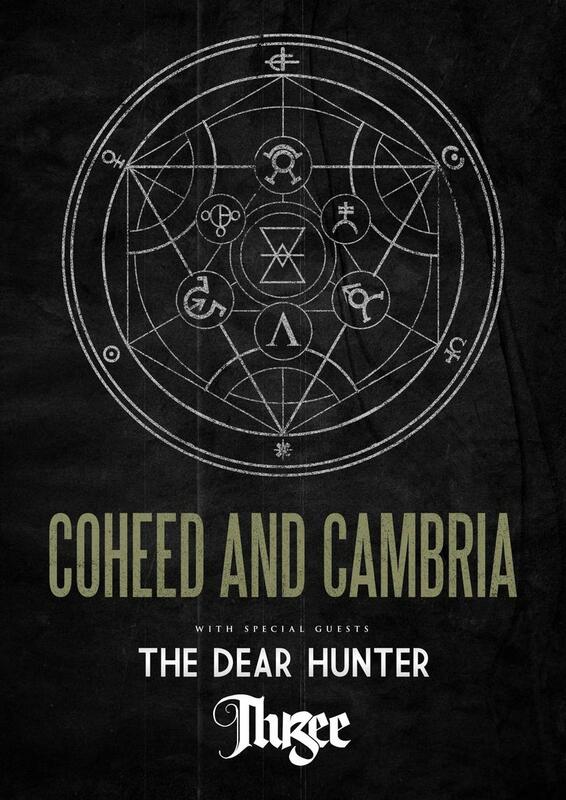 More tour dates with Coheed and Cambria have just been added! Check out the tours page and facebook bandsintown page for more details!